Over Thanksgiving I talked my mom into letting us bring home the hand-crank pasta machine that belonged to my grandfather. 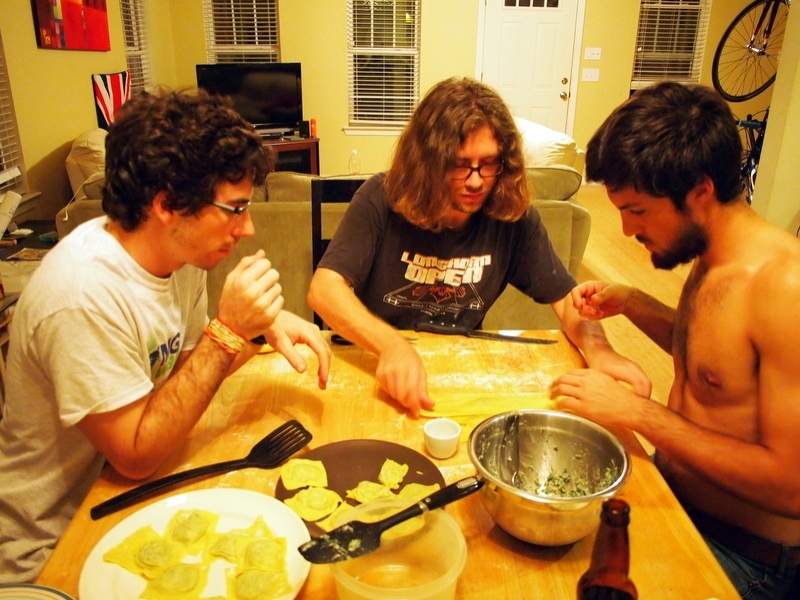 I remember making fresh pasta with him as a child, my favorite type being ravioli. My grandfather had a ravioli press, but unfortunately it was not in my mother’s possession. As a first dish, I made these ravioli. Beware – this is a time-consuming recipe, but the results are fantastic. It is best done with friends and loved ones on a lazy Sunday afternoon. Some wine or cocktails don’t hurt either! Broccoli Rabe, also known as rapini, is a slightly bitter, slightly spicy green from the mustard family. It is quite popular in southern Italy as well as in China. 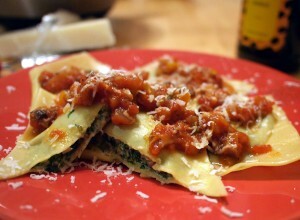 Its somewhat strong flavor pairs well with the sweetness of ricotta to make these yummy ravioli. First, place the ricotta into a cheesecloth-lined colander and let drain over a bowl in the refrigerator for several hours before you start preparing the rest of this recipe. This will get the ricotta to a thicker consistency. Steam the broccoli rabe until tender, then squeeze lightly to remove excess water. Let dry on a clean towel while waiting to use. Over medium heat, saute the rehydrated mushrooms in the olive oil. Once they are fragrant and slightly fried (about 3 minutes), reduce heat to low and add the minced garlic. Continue to saute until the garlic is lightly browned, about 2 more minutes. Remove the mushrooms and garlic from the pain, avoiding as much liquid or oil as possible. Finely chop the steamed, dry broccoli rabe. Combine the chopped broccoli rabe, drained ricotta cheese, fried garlic and mushrooms, and lemon zest in a large bowl. Season with salt and pepper to taste. Divide the prepared dough into quarters. Run each of the dough portions through the pasta machine at the widest setting 2 or 3 times, then through each setting until the finest or second-finest setting. Lay the sheets of dough on a lightly floured surface. Scoop out about 1 1/2 tablespoons of filling onto 1 sheet of dough at regularly-spaced intervals. Lay a second sheet of dough on top of the first, and lightly press down around the scoops of filling to seal the dough. 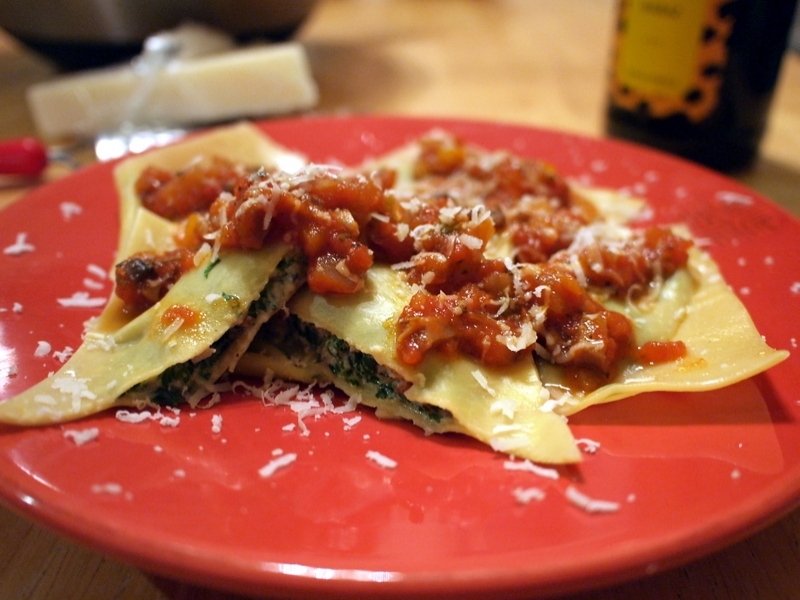 Use a knife or scissors to cut ravioli from the dough. Place the ravioli on a lightly floured plate or other flat surface, but do not stack them on top of each other (they’ll stick!). Continue step 3 until you are out of filling. You can recombine the excess pieces of dough and make new sheets if you have excess filling. Cook the ravioli 3 or 4 at a time in a large pot of salted, boiling water. They are done when they float, about 60 to 90 seconds. Serve with a sauce of your choice, such as our Garden Marinara, or just drizzled with a nice olive oil and some salt.